About Rabindranath Tagore, from some site- link. Greatest writer in modern Indian literature, Bengali poet, novelist, educator, and an early advocate of Independence for India. Tagaore won the Nobel Prize for Literature in 1913. Two years later he was awarded the knighthood, but he surrendered it in 1919 as a protest against the Massacre of Amritsar, where British troops killed some 400 Indian demonstrators. Tagore's influence over Gandhi and the founders of modern India was enormous, but his reputation in the West as a mystic has perhaps mislead his Western readers to ignore his role as a reformer and critic of colonialism. Rabindranath Tagore was born in Calcutta into a wealthy and prominent family. His father was Maharishi Debendranath Tagore, a religious reformer and scholar. His mother, Sarada Devi, died when Tagore was very young - he realized that she will never come back was when her body was carried through a gate to a place where it was burned. Tagore's grandfather had established a huge financial empire for himself. He helped a number of public projects, such as Calcutta Medical College. The Tagores tried to combine traditional Indian culture with Western ideas; all the children contributed significantly to Bengali literature and culture. However, in My Reminiscences Tagore mentions that it was not until the age of ten when he started to use socks and shoes. And servants beat the children regularly. Tagore, the youngest, started to compose poems at the age of eight. Tagore's first book, a collection of poems, appeared when he was 17; it was published by Tagore's friend who wanted to surprise him. Tagore received his early education first from tutors and then at a variety of schools. Among them were Bengal Academy where he studied history and culture. At University College, London, he studied law but left after a year - he did not like the weather. Once he gave a beggar a cold coin - it was more than the beggar had expected and he returned it. In England Tagore started to compose the poem 'Bhagna Hridaj' (a broken heart). In 1883 Tagore married Mrinalini Devi Raichaudhuri, with whom he had two sons and three daughters. In 1890 Tagore moved to East Bengal (now Bangladesh), where he collected local legends and folklore. Between 1893 and 1900 he wrote seven volumes of poetry, including SONAR TARI (The Golden Boat), 1894 and KHANIKA, 1900. This was highly productive period in Tagore's life, and earned him the rather misleading epitaph 'The Bengali Shelley.' More important was that Tagore wrote in the common language of the people. This also was something that was hard to accept among his critics and scholars. Tagore was the first Indian to bring an element of psychological realism to his novels. Among his early major prose works are CHOCHER BALI (1903, Eyesore) and NASHTANIR (1901, The Broken Nest), published first serially. Between 1891 and 1895 he published forty-four short stories in Bengali periodical, most of them in the monthly journal Sadhana. Especially Tagore's short stories influenced deeply Indian Literature. 'Punishment', a much anthologized work, was set in a rural village. It describes the oppression of women through the tragedy of the low-caste Rui family. Chandara is a proud, beautiful woman, "buxom, well-rounded, compact and sturdy," her husband, Chidam, is a farm-laborer, who works in the fields with his brother Dukhiram. One day when they return home after whole day of toil and humiliation, Dukhiram kills in anger his sloppy and slovenly wife because his food was not ready. To help his brother, Chidam's tells to police that his wife struck her sister-in-law with the farm-knife. Chandara takes the blame on to herself. 'In her thoughts, Chandara was saying to her husband, "I shall give my youth to the gallows instead of you. My final ties in this life will be with them."' Afterwards both Chidam and Dukhiram try to confess that they were quilty but Chandara is convicted. Just before the hanging, the doctor says that her husband wants to see her. "To hell with him," says Chandara. In 1901 Tagore founded a school outside Calcutta, Visva-Bharati, which was dedicated to emerging Western and Indian philosophy and education. It become a university in 1921. He produced poems, novels, stories, a history of India, textbooks, and treatises on pedagogy. Tagore's wife died in 1902, next year one of his daughters died, and in 1907 Tagore lost his younger son. 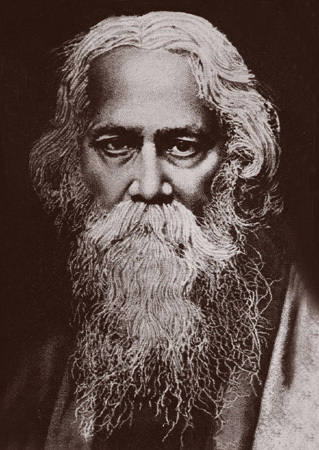 Tagore's reputation as a writer was established in the United States and in England after the publication of GITANJALI: SONG OFFERINGS, about divine and human love. The poems were translated into English by the author himself. In the introduction from 1912 William Butler Yates wrote: "These lyrics - which are in the original, my Indians tell me, full of subtlety of rhythm, of untranslatable delicacies of colour, of metrical invention - display in their thought a world I have dreamed of all my life long." Tagore's poems were also praised by Ezra Pound, and drew the attention of the Nobel Prize committee. "There is in him the stillness of nature. The poems do not seem to have been produced by storm or by ignition, but seem to show the normal habit of his mind. He is at one with nature, and finds no contradictions. And this is in sharp contrast with the Western mode, where man must be shown attempting to master nature if we are to have "great drama." (Ezra Pound in Fortnightly Review, 1 March 1913) However, Tagore also experimented with poetic forms and these works have lost much in translations into other languages. Much of Tagore's ideology come from the teaching of the Upahishads and from his own beliefs that God can be found through personal purity and service to others. He stressed the need for new world order based on transnational values and ideas, the "unity consciousness." "The soil, in return for her service, keeps the tree tied to her; the sky asks nothing and leaves it free." Politically active in India, Tagore was a supporter of Gandhi, but warned of the dangers of nationalistic thought. Unable to gain ideological support to his views, he retired into relative solitude. Between the years 1916 and 1934 he travelled widely. From his journey to Japan in 1916 he produced articles and books. In 1927 he toured in Southeast Asia. Letters from Java, which first was serialized in Vichitra, was issued as a book, JATRI, in 1929. His Majesty, Riza Shah Pahlavi, invited Tagore to Iran in 1932. On his journeys and lecture tours Tagore attempted to spread the ideal of uniting East and West. While in Japan he wrote: "The Japanese do not waste their energy in useless screaming and quarreling, and because there is no waste of energy it is not found wanting when required. This calmness and fortitude of body and mind is part of their national self-realization." Tagore wrote his most important works in Bengali, but he often translated his poems into English. At the age of 70 Tagore took up painting. He was also a composer, settings hundreds of poems to music. Many of his poems are actually songs, and inseparable from their music. Tagore's 'Our Golden Bengal' became the national anthem of Bangladesh. Only hours before he died on August 7, in 1941, Tagore dictated his last poem. His written production, still not completely collected, fills nearly 30 substantial volumes. Tagore remained a well-known and popular author in the West until the end of the 1920s, but nowadays he is not so much read.